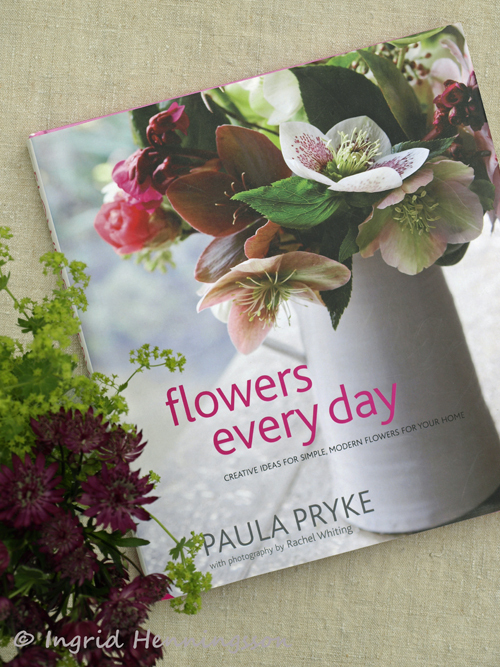 Paula Pryke's book Flowers Every Day was published last year by Jacqui Small and the beautiful photographs were taken by the London-based Rachel Whiting. In this very interesting book Paula shows us how we can combine flowers and plants from our own garden with flowers bought at the market or flower shop to make very reasonably priced flower arrangements . 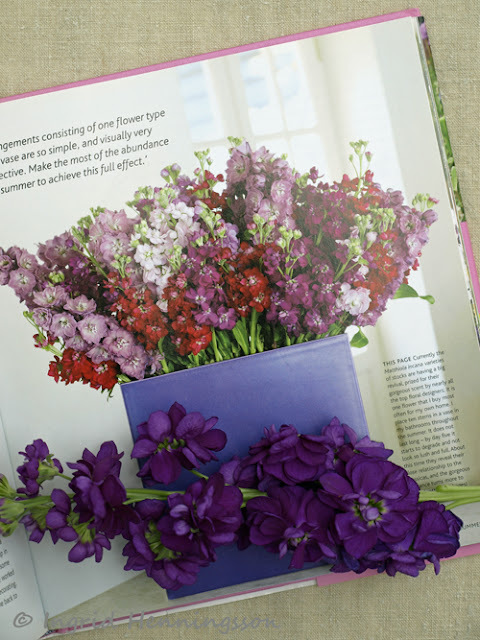 The book is divide up into the four seasons and for each season Paula shows us how we can enjoy flowers in our homes every day of the year. 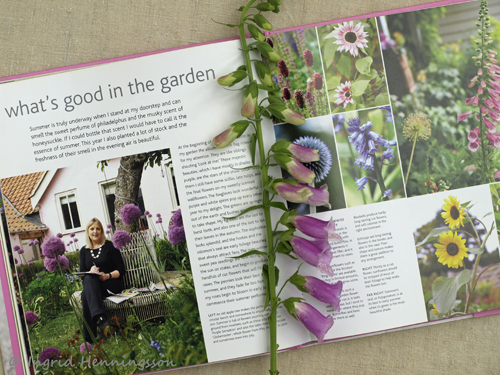 Each chapter has a section on what's good to grow in the garden. 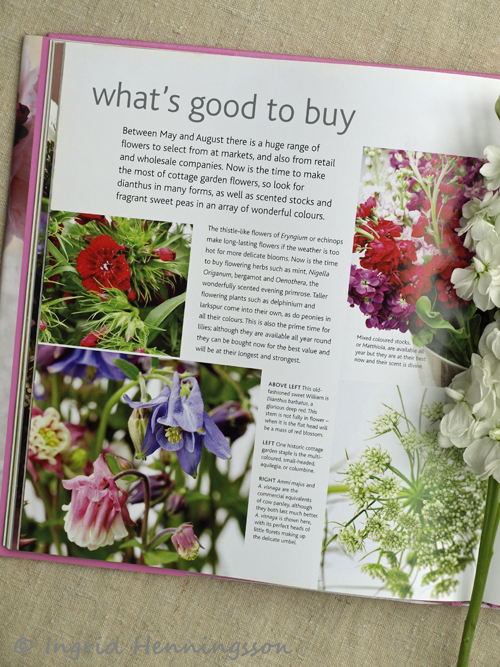 Paula has picked out her favourite flowers and has planting plans for beds and borders to help you produce a plentiful supply of flowers all year around. She tells us what flowers and foliage are good to buy from the florist, farmers market or super market; she looks at cost, longevity and availability. 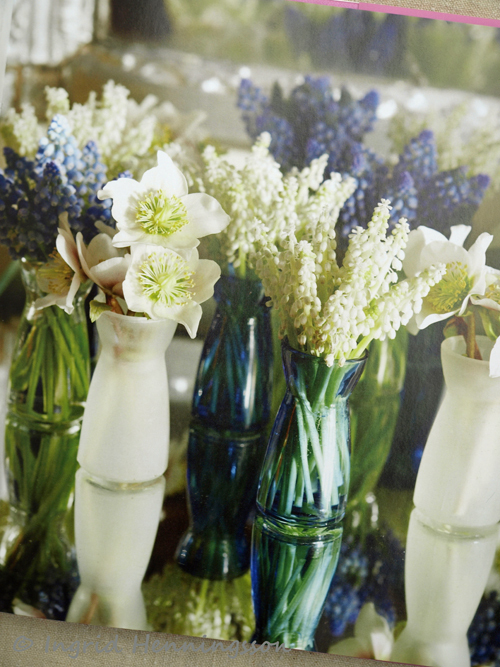 The spring chapter covers early spring flowers like Muscari and Hellebores featured here in lovely little coloured glass vases.. This lovely pastel Easter table arrangement has gorgeous Ranunculus and daffodils in a long low vase decorated with washi tape. Another stunning table decoration arranged in a bark basket with spring flowers in pink tones. 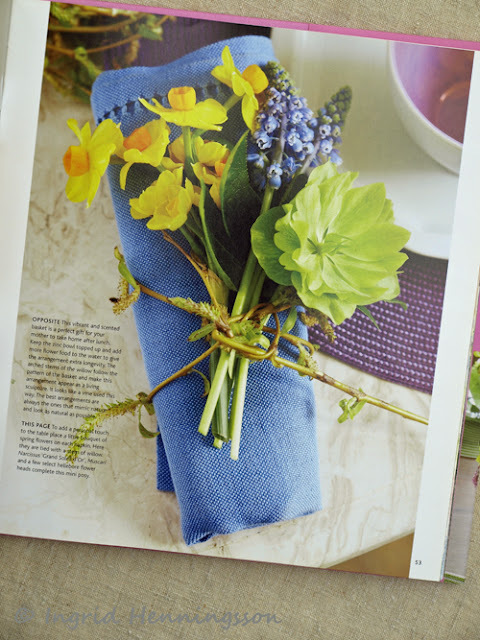 For Mother's Day lunch she has created napkin decorations using the classic spring flowers - daffodils, Muscari and hellebore tied with a stem of willow. 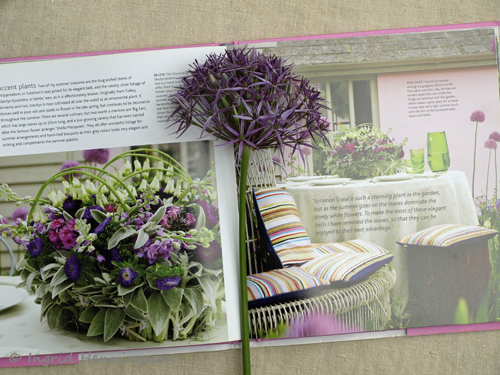 A summer arrangement for a light lunch in the garden. Solomon's seal, lambs' ears, phlox, stock and purple asters. It's like having 'summer' in a basket! This arrangement consists of one type of flower in a simple one colour vase. An abundance of summer flowers that works every time! This is a wonderful autumn arrangement - a branch of purple slow berries and five huge heads of Hydrangea macrophylla 'Bela'. 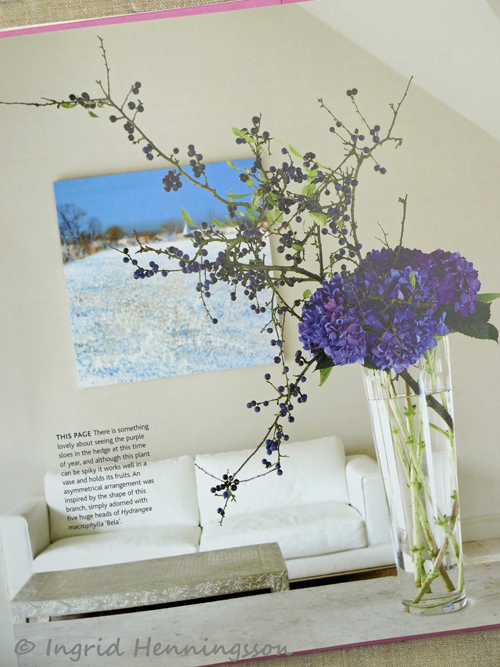 An asymmetrical and quite dramatic arrangement in its simplicity. 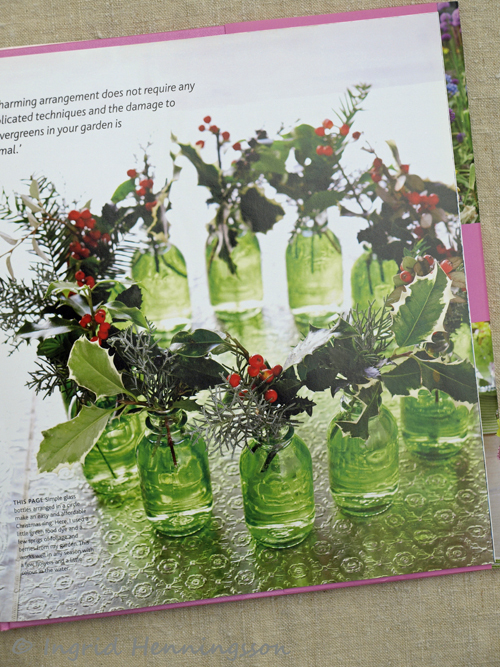 Here is a lovely little Christmas arrangement using simple glass bottles with a few different foliage sprigs and berries from the garden. 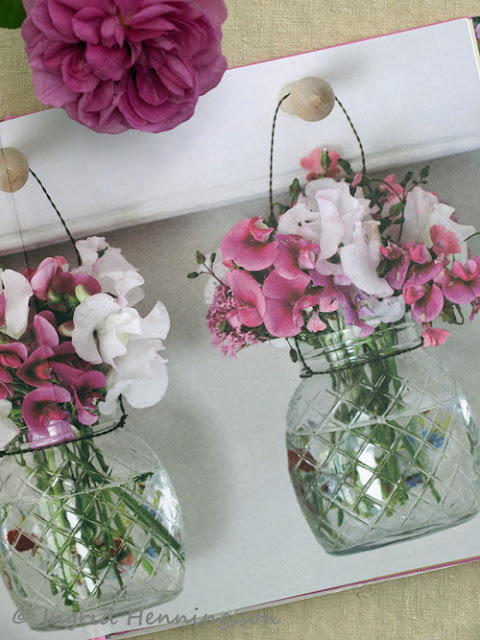 The last image is of some hanging glass jars with sweet peas - simple and beautiful. 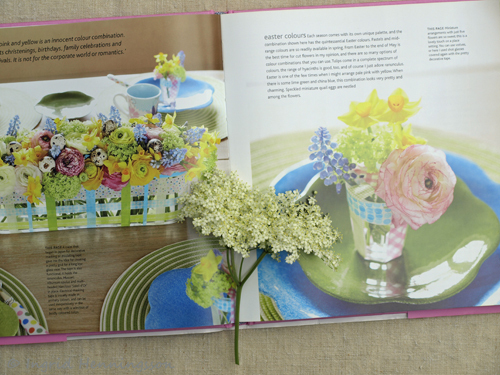 I hope you like the book as much as I did and happy flower arranging. Thank you for your lovely book review! 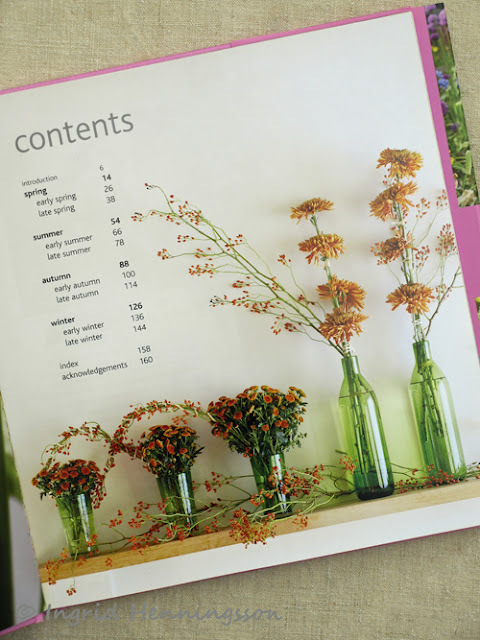 This book looks like a true winner...there's so much inspiration in the photos...and some ideas look easy enough for anyone to try. 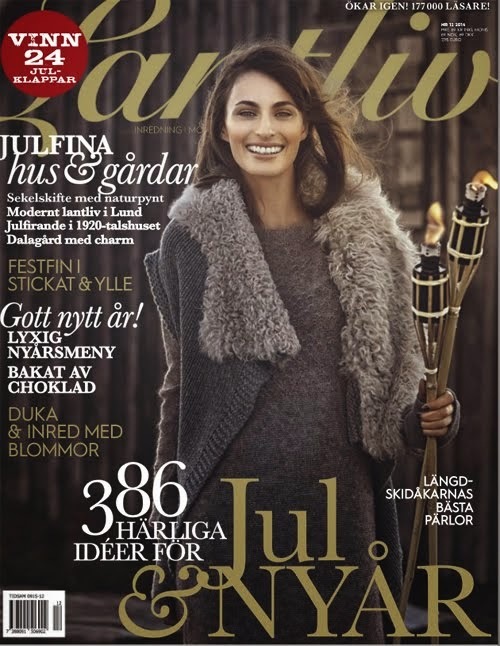 Ser ut att vara en UNDERBAR bok! Ett måste! 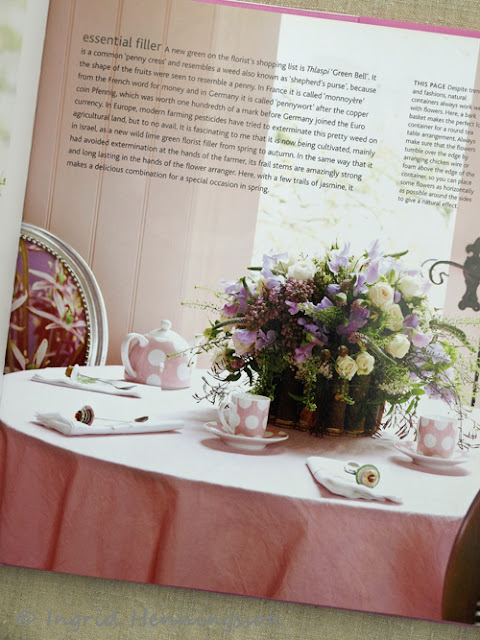 Looks like a beautiful book Ingrid! C'est une très bonne idée d'associer les fleurs du jardin et celles achetées dans le commerce. J'ai déjà tenté l'expérience et ça donne des bouquets très naturels.